Georgia head coach Kirby Smart, right, runs down the sideline as running back D'Andre Swift (7) runs for a 64-yard touchdown during the Southeastern Conference championship against Auburn at Mercedes-Benz Stadium on Saturday, Dec. 2, 2017 in Atlanta, Ga. It didn't take long this season for Georgia freshman running back D'Andre Swift to find his niche. The 5-foot-9, 215-pounder from Philadelphia showed the versatility he has displayed all season in the 31-10 opening win over Appalachian State, rushing six times for 31 yards and collecting three receptions for 18 yards. Judging by Kirby Smart's excitement after that game, Swift already had shown he could do the little things, too. "That No. 7 out there on offense knows how to block," Smart said. "Go watch that tape of No. 7. He made me proud. He carried the ball his whole career in high school, and he came in here tonight, and he blocked people." 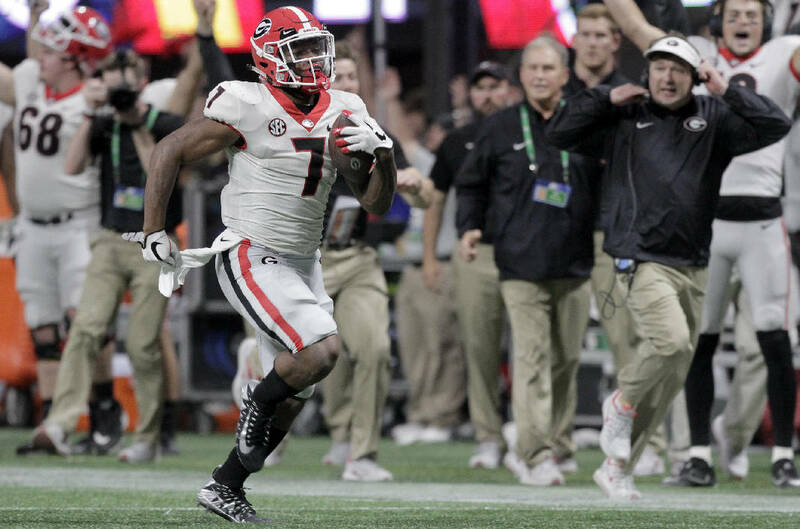 Knowing that third-string status was the best he could attain behind the senior duo of Nick Chubb and Sony Michel, Swift still managed to make the most of his debut season that will continue in the Rose Bowl on New Year's Day, when the No. 3 Bulldogs (12-1) face No. 2 Oklahoma (12-1). He has rushed 73 times for 597 yards, averaging a robust 8.2 yards per carry, and has 15 receptions for 146 yards, an average of 9.7 per catch. Swift has reached the end zone four times, including his 64-yard run in the fourth quarter of the Southeastern Conference championship game that capped the scoring in the 28-7 victory over Auburn. "The run felt good, but winning the SEC my freshman year is something else," he said moments after the triumph in Atlanta. "My favorite moment has been this win and just seeing all the smiles on the faces of the seniors." Said Chubb: "He was moving on that one. We're proud of him. He's a great running back." Swift's first impacting of the offense was a one-handed reception midway through the second quarter of the opener, when fellow freshman Jake Fromm was taking the reins at quarterback from an injured Jacob Eason. "I kind of knew I could contribute," Swift said. "If they would trust me to put me on the field, I knew I could make plays, because that's the kind of person I am. I stay humble and work hard every day. "In the practices before the start of the season, I knew I was going to get my shot." Swift only had two rushes in Georgia's 20-19 win at Notre Dame in the second game of the season, but one of them went for 40 yards. Georgia's fourth game of the year was a top-25 showdown against Mississippi State inside Sanford Stadium, which resulted in a 10-carry, 69-yard performance, his busiest of the season. His season-long run of 71 yards occurred Oct. 14 against Missouri, when Swift rushed six times for a season-high 94 yards. "He continues to be a great change-up asset to our offense," Smart said after the Missouri game, "from catching the ball out of the backfield and running the ball. He's a hard worker." Swift was a consensus top-100 national prospect in the 2017 signing class, and he joined a backfield that became the first in SEC history to contain a 4,000-yard career rusher (Chubb) and a 3,000-yard career rusher (Michel). It's a situation Swift has not taken for granted. "Those two guys — I can't say enough about them," Swift said. "They're amazing role models and big-brother figures. They told me to be patient and to seize every opportunity. They tell me all the time that I'm next up, and that's how I work. "They would do anything for me, and I would do anything for them." The Bulldogs are down to either one or two games with Chubb and Michel, and Swift recognizes that he soon will be looked upon to carry the tailback torch in 2018. "I believe I can do it," he said. "I'm ready." Bulldogs freshman defensive back Latavious Brini, who is redshirting this season, was arrested Tuesday night by the Clarke County Sheriff's Office on the felony charge of first-degree forgery. Brini, a 6-2, 196-pounder from Miami Gardens, Fla., was released on a $5,700 bond. The arrest, according to the Athens Banner-Herald, stems from a July 22 incident in which police responded to the Pet Supplies Plus store at the Alps Shopping Center after the store manager reported a fake $100 bill was used on an $8 purchase eight days earlier. The individual who used the fake bill received $92 in return. During the transaction, the cashier had a conversation with the individual and started a store rewards card for him. The individual provided a different name and address other than his own. According to the July 22 report, "The manager had called the police on this date because the same cashier had notified her that the suspect had come back into the store and that they used a debit card with another name for the latest transaction. The name for the transaction on the date of this report was as follows: Latavious Brini, and the subject used a Visa debit card. The store had record through their rewards system for a Brini subject." Brini is the third Georgia player arrested since the Bulldogs won the SEC title. Several hours after defeating Auburn, junior inside linebacker Natrez Patrick and receiver Jayson Stanley were arrested in Barrow County for marijuana possession, with Stanley also getting charged with driving under the influence. Junior linebacker Roquan Smith is a unanimous All-American, becoming the fourth Georgia player in the last 20 years — joining cornerback Champ Bailey (1998), punter Drew Butler (2009) and outside linebacker Jarvis Jones (2011-12) — to earn such distinction. ... Smart is among seven finalists for the 2017 Paul "Bear" Bryant Coach of the Year Award, joining Paul Chryst (Wisconsin), Scott Frost (formerly of UCF and now with Nebraska), Clay Helton (Southern California), Gus Malzahn (Auburn), Jeff Monken (Army) and Dabo Swinney (Clemson). The winner will be announced Jan. 10 in Houston.